After ten years and six studio albums, Swedish power metallers BLOODBOUND are set to release a new live DVD/CD, entitled One Night Of Blood, on February 12th. 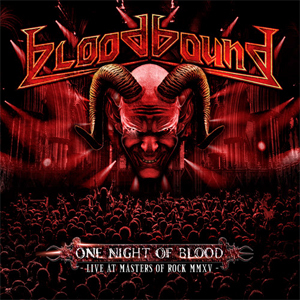 The featured concert was recorded at the Masters Of Rock Festival 2015 and it includes songs from all BLOODBOUND studio albums, with Tabula Rasa marking the sole exception. One Night Of Blood comes as a DVD/CD package in Digipak format via AFM Records. "In The Name Of Metal"
"When The Kingdom Will Fall"